Senior Trump administration officials told reporters on Wednesday that Steven Mnuchin, the Treasury secretary, has briefed many finance ministers of other countries about the plan to select Mr. Malpass and that they have been “receptive” to the choice. The officials said that Mr. Malpass has a history of working constructively with China and that he would honor commitments the bank had made on issues such as climate change. 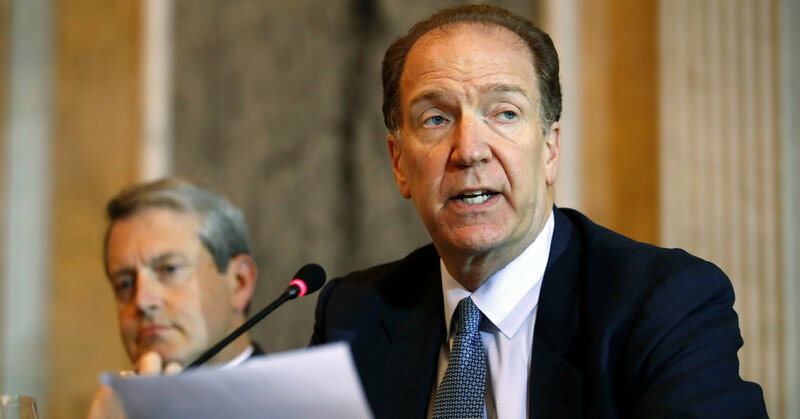 If approved by the bank’s board, Mr. Malpass could put additional pressure on China at a time when it is locked in a protracted battle with the United States over geopolitical and economic dominance. The Trump administration has been urging the bank to reduce lending to China, which since 2016 has received more than $7.8 billion in loans, according to the Center for Global Development. In 2017 comments at the Council on Foreign Relations, Mr. Malpass argued that this should change. Last year Mr. Malpass helped negotiate a $13 billion capital increase for the World Bank. One condition of the agreement was that richer developing countries, such as China, would face higher borrowing costs. The Trump administration’s doubts about the causes of climate change could also stoke concern about Mr. Malpass’s role. The World Bank has identified combating climate change as a key priority and plans to invest $200 billion over the next five years. Roger Stone Posted a Photo of a Judge Beside Cross Hairs. She Ordered Him to Court.